Lynnwood, by Thomas Brown, was a finalist in the People’s Book PrizeThe unthinkable is happening in Lynnwood - a village with centuries of guilt on its conscience.Who wouldn’t want to live in an idyllic village in the English countryside like Lynnwood? With its charming pub, old dairy, friendly vicar, gurgling brooks, and its old paths with memories of simpler times. A Taste for Blood, by David Stuart DaviesTwo plots running parallel... you won’t see what’s comingTwo laser-sharp detectives, two thought-provoking cases and two skilful plots.Featuring private investigator Johnny (One Eye) Hawke, and his one-time colleague in the police force Detective David Llewellyn. Llewellyn is investigating the chilling crimes of a top psychiatrist and his scheming patient who the doctor believes has knuckled under his authority. In the meantime, Hawke is on the case of a mysterious suicide in Edgware Road... soon discovered as not your average suicide.The guts and insight of the two investigators bring both cases to a head - though you won’t even begin to see how until you have turned the last pages.Ellipsis, by Nikki Dudley”Right on time,” Daniel Mansen mouths to Alice as she pushes him to his death. Haunted by these words, Alice becomes obsessed with discovering how a man she didn’t know could predict her actions. On the day of the funeral, Daniel’s cousin, Thom, finds a piece of paper in Daniel’s room detailing the exact time and place of his death.As Thom and Alice both search for answers, they become knotted together in a story of obsession, hidden truths and the gaps in everyday life that can destroy or save a person.Ellipsis is a thriller stemming from what is left unsaid, what bounces around in the mind and evaporates when trying to remember. Can there be a conclusion when no-one seems to know the truth? Thomas Brown is a graduate of the University of Southampton, where he studied MA Creative Writing. He has been Co-Editor of Dark River Press and has written for a number of magazines, websites and independent publishers. In 2010 he won the University of Southampton's Flash Fiction Competition for his story, 'Crowman'. He is also a proud member of the dark fiction writing group: Pen of the Damned. Literary influences include Friedrich Nietzsche, Poppy Z. Brite and Thomas Ligotti. David Stuart Davies is the author of six novels featuring private detective hero, Johnny Hawke, and another seven novels featuring Sherlock Holmes as well as several non-fiction books about the Baker Street detective including the movie volume Starring Sherlock Holmes. 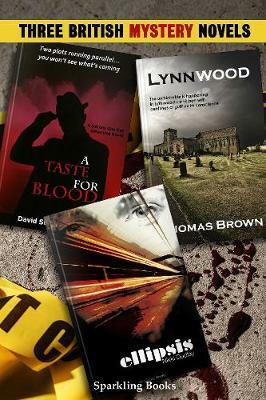 As well as being a committee member of the Crime Writers' Association, and editing their monthly magazine, Red Herrings, David is the general contributing editor for Wordsworth Editions Mystery & Supernatural series and a major contributor of introductions to the Collectors' Library classic editions. Ellipsis is Nikki Dudley's first novel. Nikki also writes poetry which has been published in several magazines including streetcake, the online magazine, of which she is joint editor.